We met up with Tina Heffner and Linda Clark at the Kwik Stop at Highway 50 and 115 in Penrose. 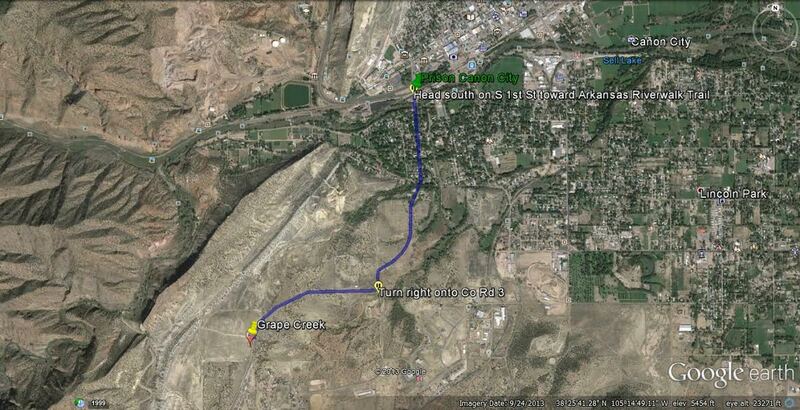 From there it was about a twenty minute drive to Grape Creek. We headed west on Hwy 50 to Canon City. Took a left (south) at the prison on First Street. Then a right (west) on County Road 3, which is also Temple Canyon Road. There is a big dirt parking lot with plenty of room to park several horse trailers and still share the lot with the unfortunate people that hike rather than ride a horse. Maestro is still a little nervous in our relatively small two horse strait load trailer. It’s a little tight for him, which causes a slight freak out but nothing bad. We opened the gate and he just stood there, refused to back out. So we opened up Rio’s side, told him to back up and he did just that. It’s like magic to me when they do that. Maestro saw that his buddy Rio was leaving the trailer and he decided to bail pretty quickly. Reverse psychology works with kids as well as horses. There was a lot of looking around, sniffing and snorting and then he settled down. Got the saddle on as well as his new jaquima and bit hanger. I thought he looked very handsome with the snazzy red and yellow accents. 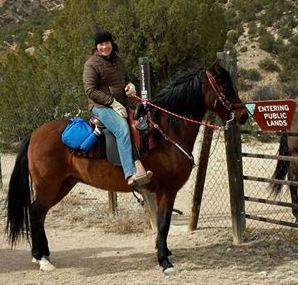 Linda was the only one that had ridden this area before so she took the lead. I wish I could tell you where we went but I was so busy looking around that I didn’t pay that much attention to how we got to where we went! I realized afterwards that this was the first time we had ever ridden in a gaited only group. Linda was on Gabby her 11 year old Missouri Fox Trotter gelding. Tina was riding Sophie, a MFT mare who is 12. Steve and I were our 20 year old Paso Finos Rio and Maestro. I have to say, it was very liberating riding with a group that all had gaited horses. Maestro kept his temper and we did not stop and wait for the group or circle around to kill time once. That might be why he didn’t have any stomping hissy fits that day? Steve did his typical thing of looking for high ground to climb or interesting things to ride over. Maestro and I joined him on a couple of narrow ridge rides that that had some spectacular views. Next time I’ll take more pics. Not a lot of rock on these trails, so we did some loping and a lot of gaiting. When we went off the dirt trails there were rocks a quite a bit of cactus. Apparently both of our guys have tangled with cactus before because we learned to hang on if they decided to play dodge the cactus as we were loping off trail. 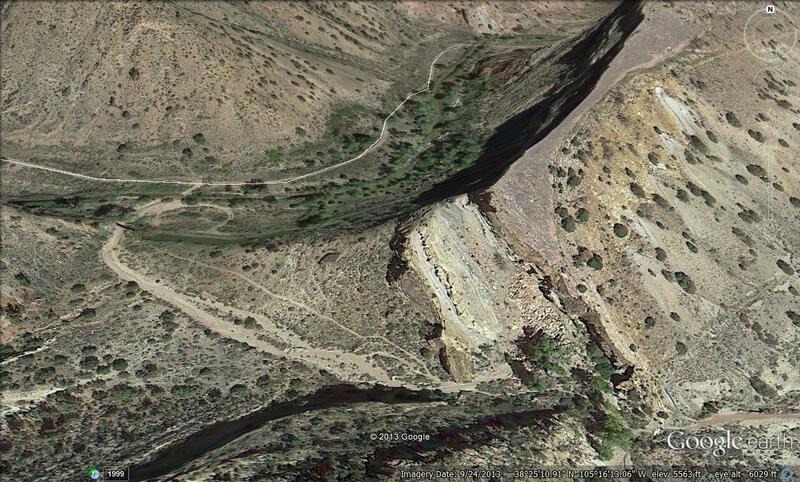 We went around a ridge line and down to the creek. What a gorgeous area. Linda said you could ride down the creek quite a ways when the weather is warmer and the water not as cold. A good excuse to go back. 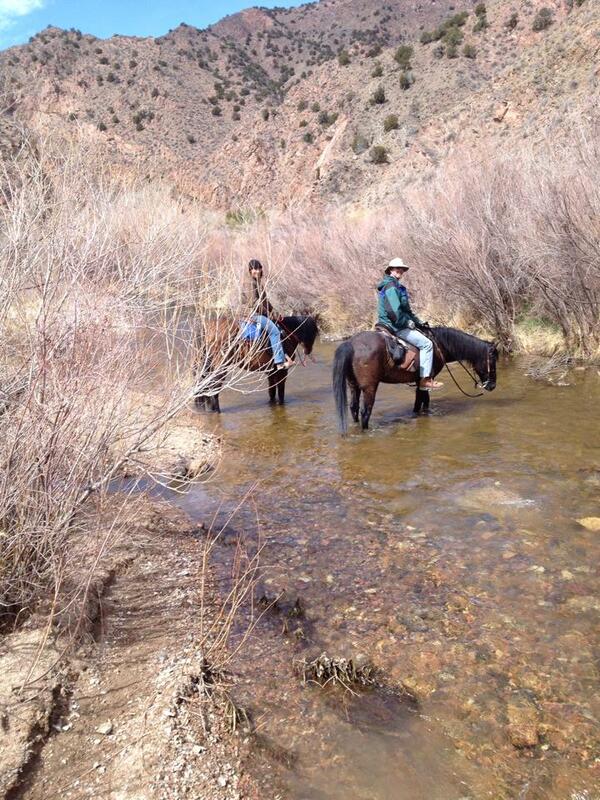 We let the horses splash around a while in the creek. Had to laugh at Rio who looks like he is trying to drown his fool self when he puts his head almost up to his eyeballs in the water. After criss crossing the creek a few times we headed back. The ride took a couple of hours. Lots of trails that went unexplored that we were taking note of for next time. Great ride, great area, awesome company.